As I got older, my style got more sophisticated. As an adult, I dress pretty nicely for work. I am embarrassed to admit how much I like to shop for dresses and shoes. I hate “going shopping” though and buy nearly all of my clothes online at discount sites. When I’m not at the office, however, I am much more about “function” than “form.” This is particularly true of the outfit I wear for my daily 3 mile long walks. And as a resident of Seattle, I have nearly every inch of me covered in Gore-Tex. My neighbor, Paula, who works for the famous outdoor recreation outfitters, REI, makes fun of my outfit. I don’t know, I think it is cat walk ready. Maybe I’ll get hired to do a Cabela’s ad to be featured in Field and Stream. For the breast cancer survivor on the go. 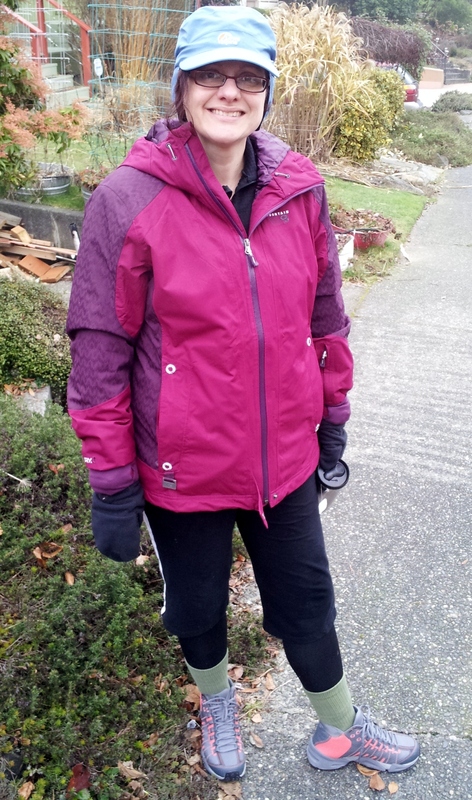 The latest in waterproof walking attire, complete with hot flash friendly layering. At least your shoes didn’t weep color when it rained! Très chic! And also quite cute! Elizabeth, you have always been stylin’. Love the cheerful color of your jacket. I am hoping that the color of the jacket attracts hummingbirds!